What WAS Roberts Thinking in the Health-Care Decision? 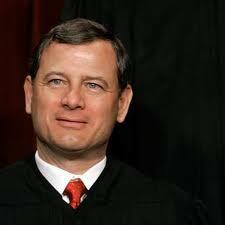 I took this link from an article in The Examiner that asked, "Is Chief Justice Roberts Actually Sly As A Fox?" This case is clearly accurate that the Affordable Care Act as a tax, as Roberts said it is to be constitutionally valid, is not in conformity with constitutional standards. Of course, that's a contradiction, but the whole question and the ruling is a ridiculous mishmash, just as is the law, which is an incomprehensible and impracticable endless compendium of unconstitutional federal co-options of commercial and individual liberty and privacy. And the silly semantic question of whether you call it a penalty or a tax is not relevant to that fact. At least the court invalidated the offense to the states. Four judges properly ruled in unconstitutional. Michael Moore wondered whether underneath it, Roberts might really have a heart. Of course, most of us conservatives are heartless. But of course, many others have considered the ruling a conservative win in that it limited the previously boundless elasticity of the Commerce Clause of the Constitution and loaded the fall campaign with a crusade over whether the law might be democratically repealed. Perhaps so. But if Roberts considered these things or that his ruling opened the act to legal prosecution of the constitutional procedure of a law that has just wrongly and inconsistently (Roberts’ argument was consistent with the thinking of the other four affirmative votes only in that it concluded in a “yea” rather than a “neigh”) been ruled constitutional, besides being mind-bending, ANY SUCH POLITICAL CALCULATION IS NOTHING OF A COURT JUSTICE’S JOB! So either his reasoning is mistaken or his disposition is misplaced. And frankly, he wouldn’t have made it this far without a pretty sound understanding of the Constitution. And the reasoning that led to his appointment, since then, and even here in the arguments apart from the validation of the bill as a tax, are perfectly clear and reasonable. So in throwing his argument in jointly with those justices who “expand” the meaning of the Constitution to accord with their personal social judgment or simply don’t appreciate its restraint (what Jefferson called the binding “chains” of the Constitution), in order to produce an affirming majority, Roberts certainly seems to justify twisting the interpretation of the Constitution in the interest of the reputation of the court or in pursuit of some larger political purpose. Neither objective is suitable to the constitutional charge of the Supreme Court. And particularly at this level, it seems manifestly petty and unprofessional. Reports were of the other judges spending around a month unsuccessfully trying to persuade him to reconsider, and that the libertarian-inclined Anthony Kennedy appeared particularly disturbed at the public reading of Roberts’ argument. I think we can safely assume that he was challenged with about as lucid accounting of a strict construction of the Constitution as is possible. And I’m frankly certain that he did not personally require the explanation. But beyond those two incentives for his constitutional sculpture, the only thing I can imagine is that he operated in the interest of reward or threat, and we would certainly know nothing of that.